The American College of Nurse-Midwives (ACNM) is the professional association representing certified nurse-midwives (CNMs) and certified midwives (CMs) in the United States. According to the American Midwifery Certification Board, as of August 2017, there were 11,826 CNMs, and 101 CMs.1 The vast majority of midwives in the United States are CNMs. CMs are also licensed, independent health care providers who have completed the same midwifery education as CNMs. CMs are authorized to practice in Delaware, Missouri, New Jersey, New York, and Rhode Island. CMs have prescriptive authority in New York and Rhode Island. The first accredited CM education program began in 1996. The CM credential is not yet recognized in all states. Medicaid reimbursement for CNM care is mandatory in all states. Medicare and most Medicaid programs reimburse CNMs/CMs at 100% of physician rates. The majority of states also mandate private insurance reimbursement for midwifery services. Standards for education and certification in midwifery are identical for CNMs and CMs. (2) Hamilton BE, Martin JA, Osterman MJK, Curtin, SC, Mathews TJ. Births: Final Data for 2014. National Vital Statistics Reports; Vol 64, No 12. Hyattsville, MD: National Center for Health Statistics. 2015. (3) Fullerton J, Schuiling K, Sipe TA. 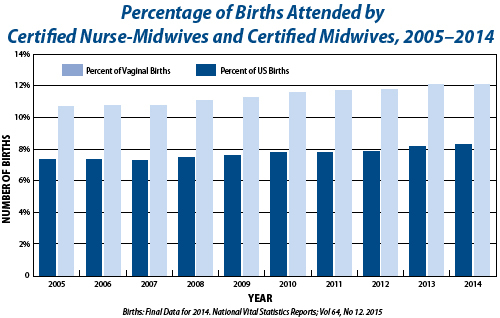 Findings from the Analysis of the American College of Nurse-Midwives' Membership Surveys: 2006-2008. Journal of Midwifery & Women's Health 2010; 55: 299-307. (7) Fullerton JT, Sipe TA, and Schuiling KD, Demographic profiles of certified nurse-midwives, certified registered nurse anesthetists and nurse practitioners: reflections on implications for uniform education and regulation. Journal of Professional Nursing. Vol 25, No 3 (May-June) 2009.